It’s here…it’s here! – Maine. Ocean. Camping. 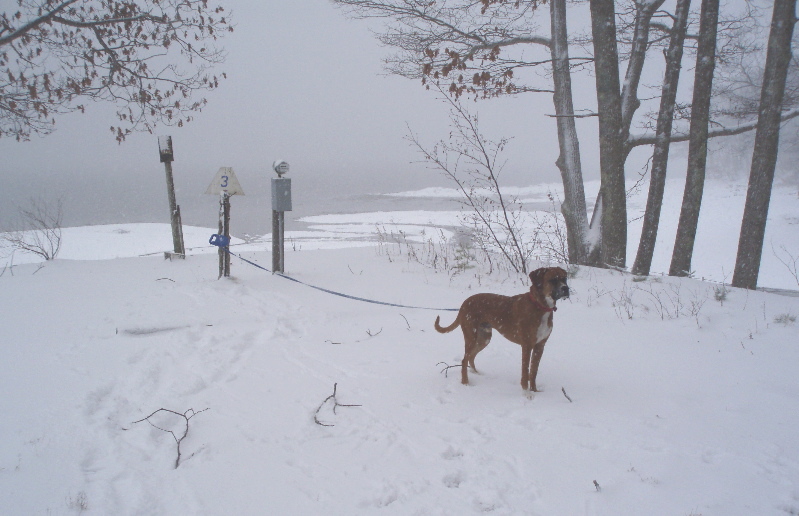 Winter arrived to Penobscot Bay yesterday at about 4:30 in the morning…and it hasn’t stopped snowing yet! It’s a winter wonderland around here with about 14 inches of snow on the ground and plenty in the sky. Our home sits in the middle of the 40 acres and is really rather tiny…so when you sit in the living room/kitchen/yarn studio you can see out the windows on three sides of the room…like living in a snow globe! I know that it started snowing a 4:30 yesterday because that’s when Bob called from Steven’s school to say that it was official…a snow day. I don’t care how old you get, snow days still feel like a vacation. So just after coffee and fresh corn muffins we layered on our sweaters and walked JJ to the beach. The tide is way out first thing in the morning right now so as long as we don’t slip and fall, we can walk to the water’s edge and listen to the snowflakes sizzle on the water. Add the crackle of frozen seaweed and the murmur of the ducks and gulls and you have a symphony that’s unique to our world. Through the blessing (?) of laptop computers, both Steven and I were able to work at the kitchen table watching the Bay all day long. I designed and printed the cards for our stay most of the summer guests, got caught up on e-mail now that our Verizon issues seem to be resolved…I won’t bore you with the irritating details of that resolution…and designed and ordered business cards for Fiber College…when it works, who doesn’t love the internet? Steven’s capturing details of his Garden Project Curriculum with the intent someday of having a complete package to offer other schools and community garden programs. You can visit his blog by going to http://www.gardenproject.wordpress.com. It was good to snuggle in after spending Sunday doing chores, putting away the last minute clutter before the snow blanketed the ground and driving to Monroe for our smokehouse order. 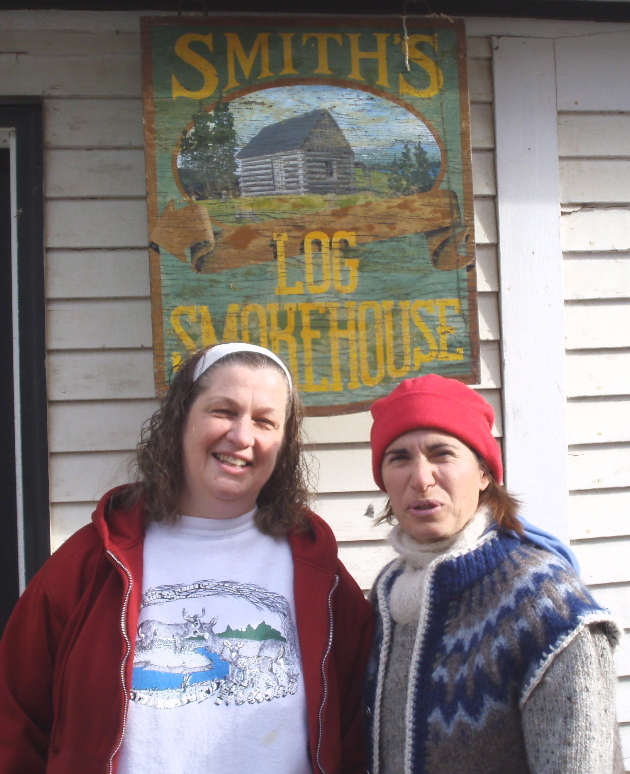 Here’s a photo of Libby…the smokehouse guru and me…you’ll notice that staying warm was far more important than looking like Men in Tree’s sort of women ;). The drive to Monroe takes us through Swanville and there’s a little grocery store on the corner (If I could have captured the front sign in a photo, you’d read “Best grocery store by a Dam site” in bold letters…because it’s right beside a river dam…rather cool). The best reason to stop at the store though is for the fresh Maine cranberries and the venison mincemeat. I love the little grocery stores because if you look around a bit, you can still find local products that aren’t profitable enough for the big chains. Taking advantage of the natural lack of interest in campgrounds this time of year, I’m able to spend the majority of my hours knitting, spinning, beading and re-capturing my closets after a summer of just tossing things in and hoping for the best. For a couple of months (did I mention that I don’t really do anything quickly?) I’ve been spinning and knitting a large circular vest with wool that we dyed as a campground activity last August. It’s a massive swirl of pinks, lavenders, teals and greens designed to look a bit summery but feel really cozy…exactly what I need when the spring/summer breezes are blowing in from the Bay. Of course, I only have 1 inch to go and ran out of yarn so I’ll leave you now in order to spend more time with my spinning wheel. If all goes as I plan, I’ll have photos of my new project to share with you tomorrow.